A majority of Latinos (54%) believe that the economic downturn that began in 2007 has been harder on them than on other groups in America. Large shares report that they or someone in their household has been out of work in the past year (59%); that their personal finances are in “only fair” or “poor” shape (75%); that they canceled or delayed a major purchase in the past year (49%); or that they are underwater on their mortgage (28% of Latino homeowners). The findings are drawn from a new telephone survey of a nationally representative sample of 1,220 Hispanic adults conducted by the Pew Hispanic Center, a project of the Pew Research Center. For a full description of the survey methodology, see Appendix C.
Household wealth: From 2005 to 2009, median household wealth (all assets minus all debt) among Latinos fell by 66%, compared with a drop of 53% among blacks and 16% among whites (Kochhar, Fry and Taylor, 2011). Unemployment: According to the Bureau of Labor Statistics, the unemployment rate among Latinos in December 2011 was 11.0%, up from 6.3% at the start of the Great Recession in December 2007. Over the same period, the national unemployment rate increased from 5.0% to 8.5%. Poverty: Between 2006 and 2010, the poverty rate among Hispanics increased nearly six percentage points—more than any other group—from 20.6% to 26.6%. By contrast, poverty rates among whites increased from 8.2% to 9.9%. And among blacks,1 poverty rates increased from 24.3% to 27.4% (DeNavas-Walt, Proctor and Smith, 2011). The new Pew Hispanic survey finds that most Latinos are broadly aware of these trends. 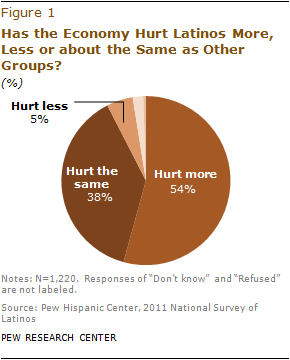 Fully 54% say Hispanics have been hurt more than other groups by the economic downturn of the past four years, while just 5% say they have been hurt less. 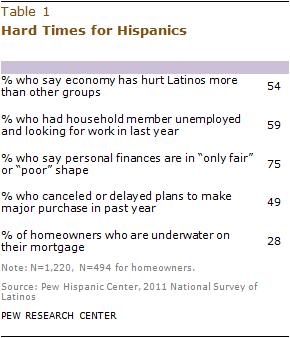 Some 38% say Hispanics have been affected about as much as other groups. Despite these downbeat assessments about their current economic circumstances, Latinos are more upbeat than others about the prospect for better days ahead—both for themselves and their families in the short term and for their children over the long haul. 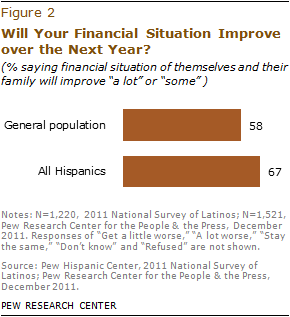 Fully two-thirds (67%) of Latinos say they expect their financial situation to improve over the next year, compared with 58% of the general population who say the same. 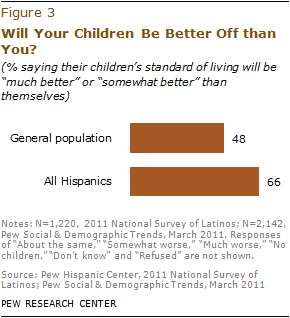 Also, two-thirds (66%) of Latinos say they expect their children to eventually enjoy a standard of living that is better than theirs is now. By contrast, just 48% of the general public says the same. The Latino population, at 50 million strong, is the largest minority group in the country. Some 52% of Latino adults are immigrants, and 48% were born in the United States. As is often the case, the new survey finds significant differences in the attitudes and experiences reported by these two groups. In general, immigrants are more downbeat. For example, 62% of Latino immigrants say Latinos have been more hurt by the bad economy than other groups, compared with 45% of the native born who say the same. Just 16% of immigrants say their economic situation is “excellent” or “good,” compared with 32% of the native born. And 63% of immigrants say they expect their financial situation and that of their family to improve in the coming year, compared with 71% of the native born. Immigrants, however, are more likely than the native born to say their children will eventually have a higher standard of living than theirs is now—72% versus 59%. The 2011 National Survey of Latinos (NSL) focuses on Latinos’ views of the economy, their own personal finances and experiences with the housing market. The survey was conducted from November 9 through December 7, 2011, in all 50 states and the District of Columbia among a randomly selected, nationally representative sample of 1,220 Latino adults. The survey was conducted in both English and Spanish on cellular as well as landline telephones. The margin of error for the full sample is plus or minus 3.6 percentage points. This report was written by Director Paul Taylor, Associate Director Mark Hugo Lopez, Research Analyst Gabriel Velasco and Research Assistant Seth Motel. Rakesh Kochhar provided comments on an earlier draft of the report. The authors thank D’Vera Cohn, Cary Funk, Leah Christian, Richard Fry, Scott Keeter, Rakesh Kochhar, Rich Morin and Kim Parker for guidance on the development of the survey instrument. Ana Gonzalez-Barrera provided research assistance. Eileen Patten number-checked the report. Marcia Kramer was the copy editor. “Foreign-born U.S. citizens” refers to persons who indicate they are “foreign born” and who indicate they are U.S. citizens. The terms “foreign-born U.S. citizens” and “naturalized U.S. citizens” are used interchangeably in this report. “Foreign-born legal residents” refers to persons who indicate they are foreign born and who say they have a green card or have been approved for one. “Foreign born who are not legal residents and not U.S. citizens” refers to persons who indicate they are foreign born and who say they do not have a green card and have not been approved for one.